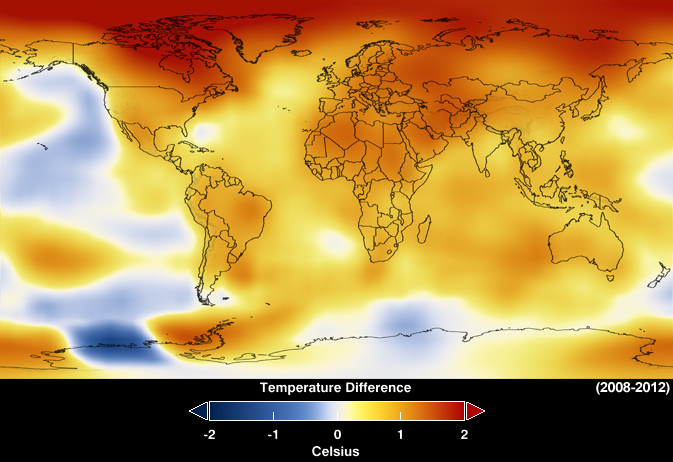 According to reports from NASA’s GISS division, 2012 was the 9th hottest year on record globally. It was also the hottest year on record for the continental United States. The above image is a composite heat map showing global temperature difference for the 2008-2012 period — a period that has included one hottest year (2010) and two consecutive La Nina years that ranked 2nd and 3rd hottest (2011, 2012). Overall, 2008 was the 12th hottest year on record, 2009 the 7th hottest, 2010 the hottest, 2011 the 10th hottest, with 2012 coming in 9th hottest. The last year that experienced temperatures cooler than the 20th century average was 1976. Given the degree to which heat keeps building up in the atmosphere due to human CO2 emissions, a record 34 gigatons in 2012, it is likely that the next El Nino year will produce a strong new temperature record. However, 2011 and 2012 both experienced La Nina conditions. ENSO conditions are expected to remain neutral throughout much of 2013 with chances rising for a return to El Nino by the end of this year.